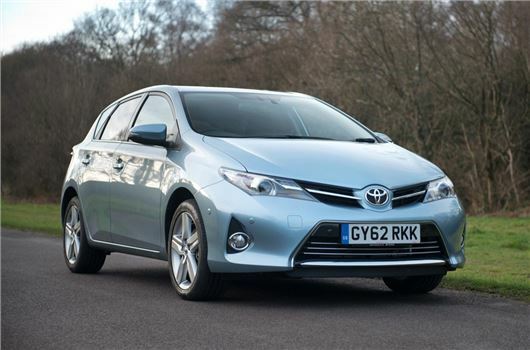 The online car dealer is also offering deals on brand new Toyota Auris Hybrid vehicles with savings of up to £4700. New Toyota Auris Active models feature 15-inch steel wheels, electric, heated door mirrors, LED Daytime running lights, follow-me-home headlight, automatic air con, 4 speaker radio with USB/AUX/MP3 support,7 Airbags, stability control & hill start assist and multi-functional steering wheel. New Toyota Auris Icon models feature 16-inch alloy wheels, front fog lamps, rear parking camera, electric, heated door mirrors, LED Daytime running lights, automatic air con, Toyota Touch 2 multimedia system, 6 speaker DAB radio/CD with USB/AUX/MP3 and bluetooth support, front and rear electric windows, leather steering wheel & gear shift and Yatomi black seat trim. Icon Plus models add 16-inch alloy wheels, privacy glass, retractable wing mirrors, heated sports seats and sat nav. New Toyota Auris Excel models feature 17-inch alloy wheels, auto windscreen wipers and headlights, privacy glass, retractable wing mirrors, front fog lamps, rear parking camera, cloth interior trim with leather bolsters, Toyota Touch 2 multimedia with sat nav, dual zone automatic air con, smart entry and start, intelligent park assist, automatic rear-view mirror and 6 speaker DAB radio/CD with USB/AUX/MP3 support.